My taste in jewellery is very definite. I'm way more in the bold and edgy camp than the sweet and delicate one. For me to fall in love, an accessory has to be either super plain, very bold or, best of all, it has to have bite. That's why I fell in love with the look and more importantly, the ethos behind Lovebullets. An independent British brand, Lovebullets have an unique approach to making beautiful items out of objects of hate. In their own words, 'transforming items of destruction into works of art, jewellery and fashion accessories to express an ideology of love overriding negative thought.' Isn't that gorgeous? I love the idea of taking hateful, fearful objects and turning their meaning on its head. Plus their stuff looks so good! I've wanted one of their pendant necklaces for a long time and I finally got my hands on this obsidian design. Anything with raw and rough cut crystals is a big draw to me. I think nature is always the most beautiful thing when it comes to adornments so I'm very drawn to crystals in their original state. 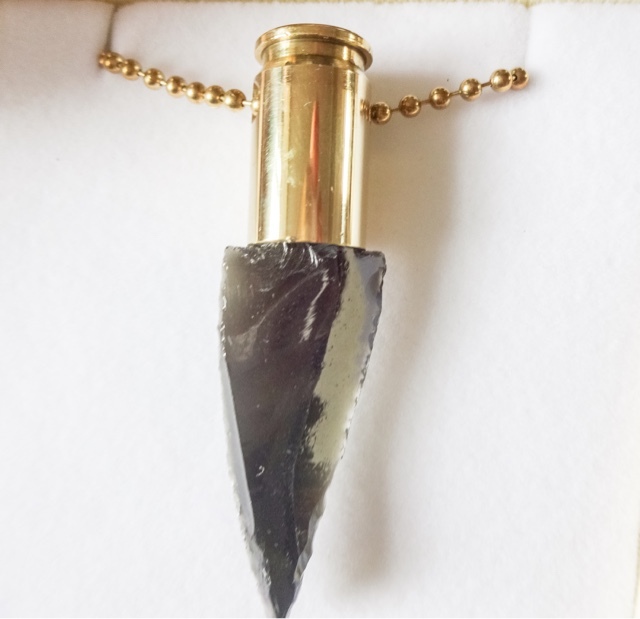 The rough obsidian shard is set in a gold plated bullet shell, so it's literally like nature and something beautiful coming out of a symbol of destruction. This piece is very bold but there are plenty with more soft looking crystals like rose quartz. 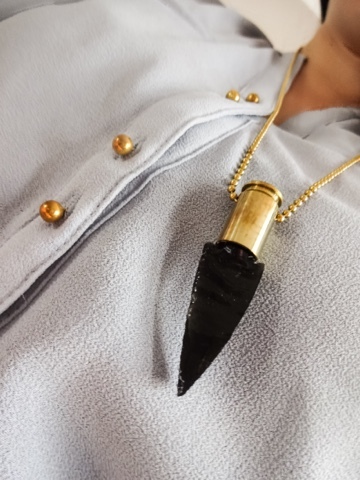 Lovebullets have a very rock n roll heritage, being started at Glastonbury back in 2008 playing DJ tunes out of a decommissioned army tank and seeing their jewellery designs quickly snapped up by the A-list, who know the value of an edgy accessory. 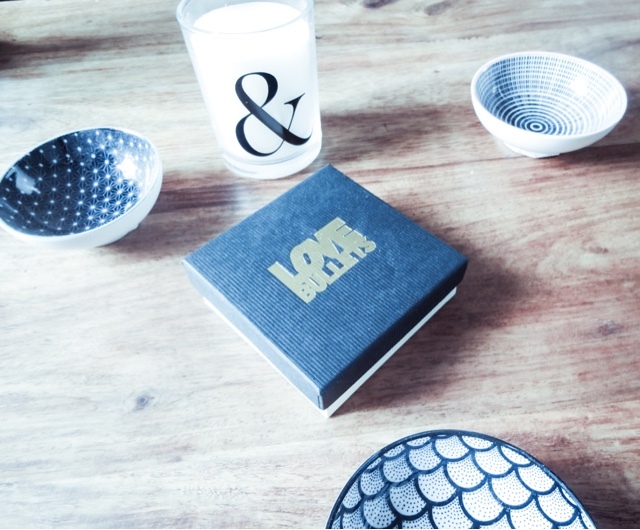 All their pieces are handmade by a team of artisans in the UK and they are beautiful quality, as you would expect. 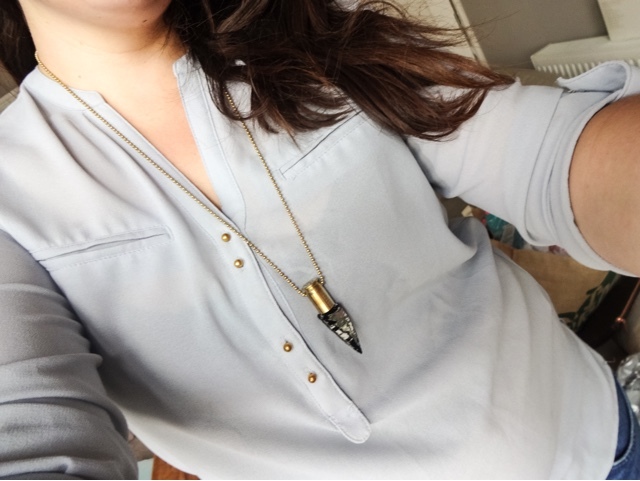 I just love this necklace for adding a bit of unexpected edge to a smart outfit. It's an amazing design that would suit a guy as much as a girl really. Because of the brand's message and ethos, their pieces genuinely feel like little works of art, all repurposing the ugly artillery of war into little pieces of gorgeousness. 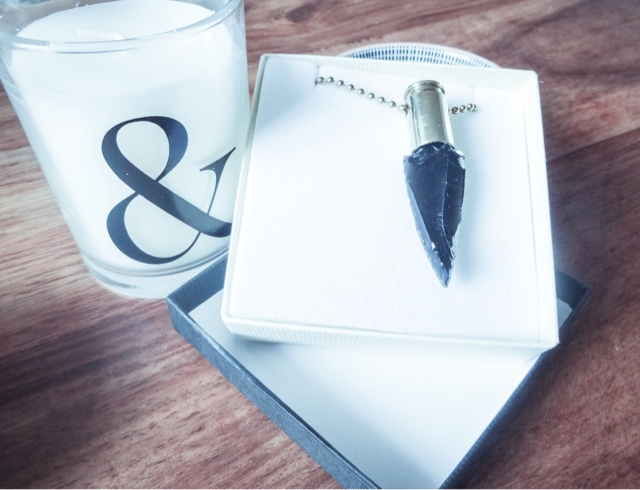 So if you like edgy accessories and you're looking for something a bit different, you might be into Lovebullets jewellery as much as me. Check them out here.